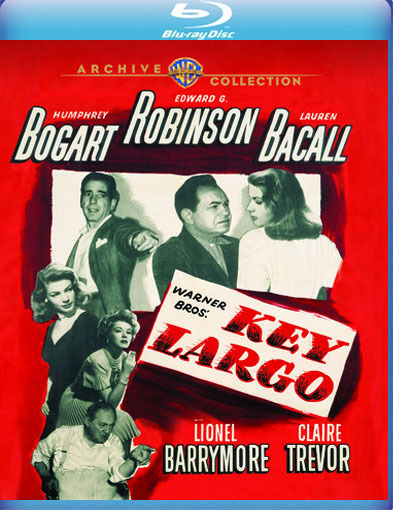 The Warner Archive has released KEY LARGO (1948), starring Humphrey Bogart and Lauren Bacall, in a beautiful Blu-ray edition. The Archive previously released a Blu-ray of Bogart and Bacall's THE BIG SLEEP (1946), which I reviewed in March. Their DARK PASSAGE (1947), which I reviewed at Noir City Hollywood last year, has come to Blu-ray as well. All we need now is a Blu-ray edition of the first Bogart-Bacall film, TO HAVE AND HAVE NOT (1944). 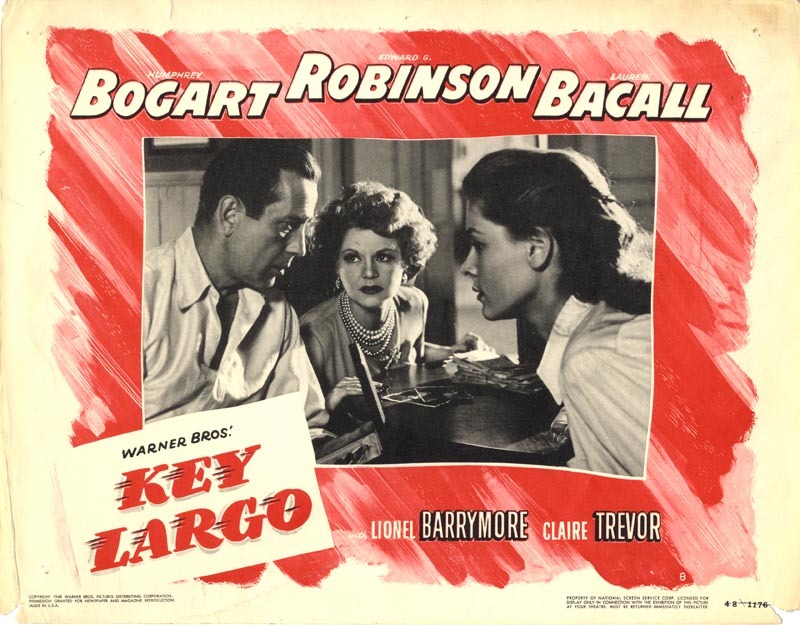 Like the other Bogart and Bacall films, KEY LARGO is a movie I saw many times on local television when I was growing up, and it helped further my interest in classic films. It holds up quite well, although watching it for the first time in years, it was more apparent to me that it was a filmed stage play. That play, by Maxwell Anderson, was adapted into a screenplay by Richard Brooks and John Huston, with Huston also directing. The play's original cast, incidentally, included James Gregory, Paul Muni, Jose Ferrer, and Karl Malden. 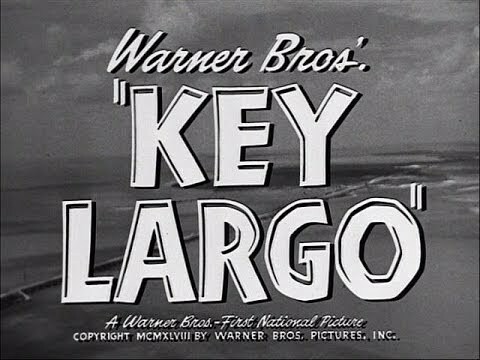 I also realized this time around how much KEY LARGO has in common with THE PETRIFIED FOREST (1936), which helped make Bogart a star. Both films are essentially one-room dramas, based on plays about a group of people held hostage at a remote location. 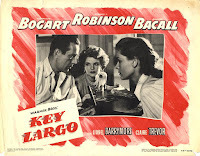 But whereas Bogart is the villain of THE PETRIFIED FOREST, he's the hero in KEY LARGO. 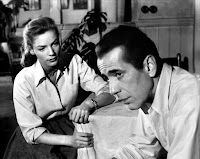 Bogart plays Frank McCloud, a WWII vet who visits Key Largo to pay his respects to James (Lionel Barrymore) and Nora Temple (Bacall), the father and widow of a close army buddy who died in action. As a hurricane approaches, McCloud and the Temples are held hostage in the Temples' hotel by gangster Johnny Rocco (Edward G. Robinson) and his hencmen (Harry Lewis, Thomas Gomez, Dan Seymour). Rocco's alcoholic moll (Claire Trevor) is also on hand. As the storm rages, Rocco and McCloud engage in repeated arguments, leading to a final confrontation on a boat once the storm has passed. Though a bit talky at times, it's a good drama with a strong cast. This is the film for which Trevor won her Oscar as Best Supporting Actress. 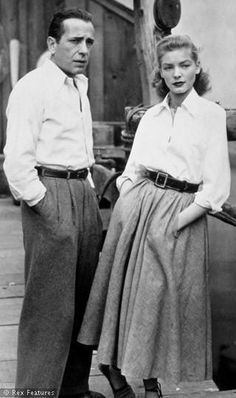 I especially like Bacall in this, playing a much more low-key, quiet woman than in her other films with Bogart. Much of her acting is nonverbal, and she does a very fine job. I also enjoy Bogart in this; it's a contemplative yet heroic role, and he makes the most of it. The supporting cast includes Monte Blue, John Rodney, Jay Silverheels, Marc Lawrence, and William Haade. 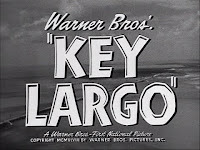 KEY LARGO was filmed in black and white by Karl Freund. The score, which is particularly good in the closing moments, is by Max Steiner. The movie runs 100 minutes. 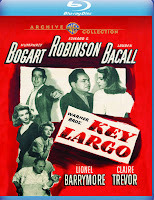 KEY LARGO is an excellent print. The disc includes the trailer.